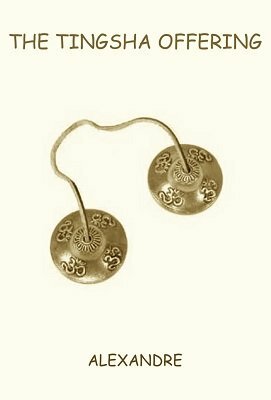 Tingsha Bells create a meditative vibration, calling one into the here and now. The striking sound clears any disturbing energies bringing clarity to any space. They can call us to awareness, to mindfully remember who we are, and to recognize our priorities in this often turbulent and changeable world. Traditionally, in Tibet, these bells were used in connection with offerings for the dead, food and water offerings for hungry ghosts, tormented spirits. This is Alexandre's Tingsha Offering ... for the LIVING! Dealing with simplicity, choice, and how to makes those into something interesting, Alexandre has decided to share this simple effect with the magic and mentalism community. Originally created as a fundraiser for a fellow performer back in 2010, this effect will leave the participant with a special gift of protection and good fortune. Please do not purchase this PDF unless you have a set of Tingsha Bells or plan on getting a set of Tingsha Bells! (recommended for spiritual growth and peace of mind). For Alexandre's presentation you will also need two easily located semi-precious stones, but with some creativity, you may use other special items.